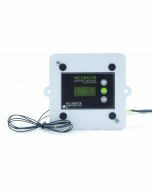 The Plug ‘n Play is a digital electronic thermostat with remote sensor designed specifically for incubators. It's great for both tabletop and cabinet incubators. It comes pre-wired and ready to use. 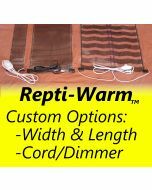 You can use any heating element up to 225 Watts. Simply plug in your heater, heat mat, or light bulb to the 3 outlet plug outlet and you’re ready to go. The temperature can be adjusted in 0.1 degree increments. Just press the up or down arrow to set it. The screen has a flame indicator to show when the heater is operating. 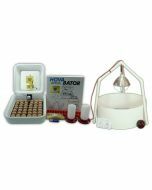 This unit comes with a 24 inch remote sensor that can be placed inside your incubator. The white thermostat may be mounted on the outside of the incubator. Comes preset to 99.5 (37.5 in Celsius mode). If the temperature goes over 99.9, it reads: 00.1, 00.2, 00.3, etc. Note: It is normal for the thermostat to turn the heater off and still have the air temperature increase a little bit. This happens because as the power to the heater turns off, the heater is still hot and will heat the air around it. The same is true when the heater turns back on: the temperature may decrease a little more as the heater gets back up to temperature. 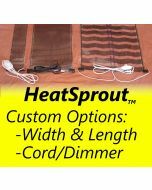 The amount this happens will depend on the amount of heat your heating element holds and the amount of circulation in your incubator. Keep in mind that the air temperature may vary without a negative impact to the eggs if the variation is rapid enough to not allow the eggs to heat or cool more than it should. As long as the up and down cycle is relatively small, is less than a few minutes, and the average air temperature is at your target temperature, the temperature inside your egg (which is what really matters) will be just fine! This is true with any incubator and egg configuration. As always, all of our products are covered by our One-year Hassle-free Guarantee. Purchase today with no worries and experience the Plug ‘n Play Digital Electronic Thermostat for yourself. Copyright © 2009-present JP Ventures LLC & Incubator Warehouse. All rights reserved.